Who likes a good soundtrack then? Personally I’ve always been a bit deaf to the music in videogames. It’s not that I don’t like it, it’s just that I don’t usually notice it. Generally if I am noticing it, it’s getting on my nerves which doesn’t normally mark wonders for whatever it is I’m playing. I completely understand, however, that to some of you the soundtrack can even come over as being better than the game. If you happen to be one of these people or just a massive METAL GEAR fan, (or both,) I may just have the thing for you. The official METAL GEAR Orchestra, (yes this is a thing,) will be touring LA and NY this Spring. Yes this is a US premier so the rest of us that don’t have lots of money or a private jet handy might have to wait a little bit to see the show. 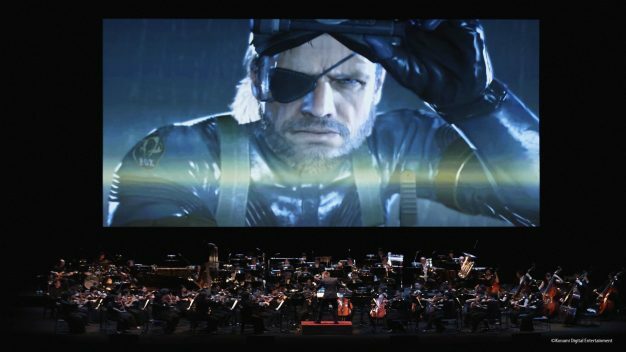 For those of you stateside the official METAL GEAR orchestral concert series will debut at New York’s United Palace on March 23rd before moving to the Willshire Ebell Theatre in LA on April 6th. Those of you lucky enough to attend will experience a concert featuring more than 70 musicians on stage including METAL GEAR singer Donna Burke. The concert will include memorable songs from the METAL GEAR Solid series. These will be a mix background music such as the “Main Theme” and “Father and Son,” and fully lyrical pieces sung by Donna Burke like, “The Best is Yet to Come” and “Snake Eater.” All of this will be perfectly synced to HD footage from the series which will be played in the background allowing for a fully rounded and memorable experience. I’m not going to talk about the METAL GEAR Solid games too much here. If you haven’t heard of Hideo Kojima’s masterpiece (minus the zombies – I’m looking at you Konami), you’ve been living under a rock for 30 years. What I will say is that this blockbusting series has sold over 50 million units worldwide since it’s inception back in 1998. Five plus games and a bunch of books later it’s a wonder nobody has taken this series to the stage sooner. If you want to go and experience the show for yourselves you can grab a ticket while they last for the New York event here. If you’re looking for the LA show you’ll be wanting this link. The rest of us will have to keep an eye out for where the orchestra winds up next. If they happen to appear in London or Manchester you might be hearing a bit more from me on the matter in the future. If I happen to acquire that jet I’ll let you know.